Remember Joey, the one eyed cat? Here he is with his new family! Poor Joey had a severe infection and had to have an eye removed and he is FIV positive. It seemed that his chance of finding a forever family would be impossible but then he met the PURRFECT family for him. They knew that he could manage just fine with one eye and that FIV can only be contracted through deep wounds or mating which makes the risk to other cats minimal. They knew that Joey was a special guy who deserved this special chance so they adopted him! Lucky Joey and lucky family! 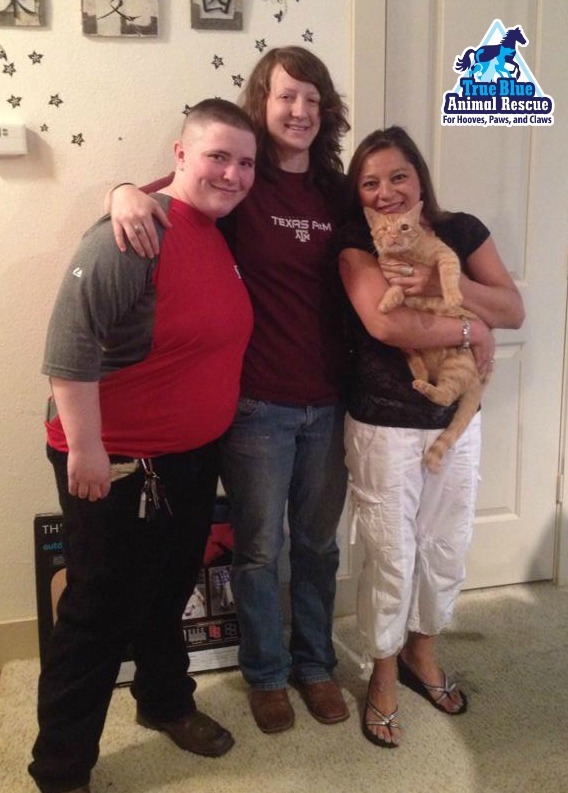 Posted in Cat Success Stories and tagged adopted, animal rescue, Cats, family, rescue, success, TBAR, Texas, Thank You, True Blue Animal Rescue.